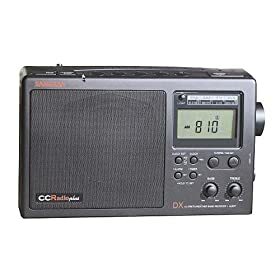 A C.Crane represantitive called me to explain that he reads my blog and he wanted to clarify the issue of the C.Crane CC Radio Plus, a big tableside radio that has received a lot of bad reviews on Amazon over the years regarding a faulty LCD screen. These reviews have thwarted a lot of radio buyers from purchasing this model. The rep made three important points. One, any radio built before 2004 may have an LCD problem because Sangean, the makers of the C.C. Radio Plus, used a ribbon cable design that was vulnerable to moisture. C.Crane will put the adhesive back on this ribbon cable design free of charge. The better news: CC Radio Plus models built since 2004, and that would mean the ones that are on sale new today, NO LONGER USE THE RIBBON CABLE DESIGN and therefore should have no LCD problems. Knowing this, I would never buy a used CC Radio Plus on eBay or anywhere else unless I was certain it was built after 2004. The third important point is that there should be a replacement for the current model in the next year to address among other things the imminent obsolescence of the TV band. He will send me updates, which I will pass on to you. Thanks for re-posting this very useful information. I've had two CCRadioplus's for about four or five years. I must have just gotten in under the bar, because neither had the LCD problem, so that I was quite happy with the radio. Both continue to be rock solid radios to this day. I've always been mystified by the almost fanatically negative reviews that users gave this radio. Perhaps it had been over-advertised, and certainly over-priced, but it was still far superior to many radios on the market. The NOAA weather band with alarms was a handy feature, and worked better than any other model I've ever used, and the TV band was of equal quality (for example, the cheap Sony ICF-36 was terrible on both bands). And one feature I've never seen mentioned - the LED lamp that plugged into the back of the radio - was just what my wife and I needed on several stormy nights without power. Needless to say, I also thought the AM and FM bands performed extremely well. The only minor complaint I had was the somewhat dull speaker tone - especially on AM. I partially resolved this by keeping the treble and bass nobs turned up all the way, or else by slightly detuning the frequency of a station, giving it a little added treble. I don't mind paying $150-$200 for a decent radio that will last for years, and I truly thought the CCRadioplus was worth every penny. Perhaps I'm not yet enough of a technical radio expert to enable me to absolutely despise one, as may reviewers have despised this model. It seems to be a perfected craft on Amazon. I do, however, enjoy listening to many hours of talk, news and music, and for me, the CCRadioplus (and now the CCRadio2) is number one. I too turn up the bass and volume on my CCR-2, which does make me like the sound significantly more. My display started acting funny a couple years ago...but about six months ago I took out the batteries and left it unplugged for a week, and now the display works fine again. I had read on that CCRADIO Yahoo group that low batteries would cause problems even if you were working off the wall plug. I can't complain...it certainly has given me my money's worth over the years. if I had read the reviews and purchased a GOOD RADIO! I have an older CCR with a dead display that I still use. Radio works fine; I just have to find stations by ear, or by reference to known stations, lol. Does anyone know where I can find a wiring diagram and parts list for CC Radio ? I have a CC radio that does not work and has parts missing.